Even though this isn’t officially a real product yet, it’s still officially really awesome! The guys at Pomfort (makers of SilverStack for desktop computers) have created this currently unnamed prototype of a REAL slate that holds an iPad running a slate app! 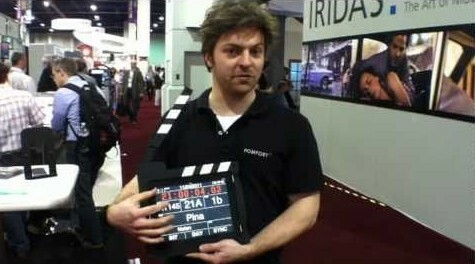 I’m a big fan of using my iPad as a film slate, but there are some drawbacks. The complaint I hear most often is about the sound. The volume of the clap can be too soft for some shooting environments. Additionally, some people simply don’t trust that the iPad will play the clap sound, and show the clap animation, in perfect sync. Pomfort’s new clapper solves both problems, while still allowing the iPad to provide those additional benefits we’ve come to love (timecode management, shot logging, etc.). For the moment, their physical slate only works with their own slate app (not released yet), but I’m hopeful they will someday allow other slate apps (like MovieSlate) to join in the fun. Since this isn’t a real product yet, you might want to contact Pomfort and let them know you’re interested. The more people that drop them a line, the more likely we are to see this become a shipping product.